This whisky is released only after 10 years in American oak casks, when its flavour is fully developed. It has a delicate, floral, smooth roundness, and the subtle smokiness contributes to the aromatic flavour. The nuttiness and hint of toffee sweetness make it hugely appealing. Created in Scotland since 1843. Perfected by the 16 men of Tain. Distilled in Scotland's tallest stills for a smooth rounded whisky. Unequalled for purity, delicacy and aroma. 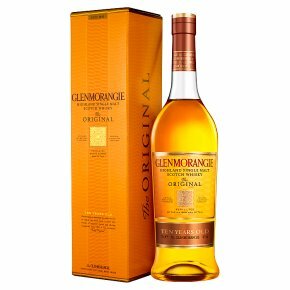 Creators of Distinction In 1843, William Matheson founded the Glenmorangie Distillery, in the Scottish Highlands. Inspired by his peaceful surroundings, he created a single malt whisky of unique complexity and exceptional smoothness. To this day, we celebrate Glenmorangie's provenance in our signet icon. Its intricate patterns echo the beauty of our homeland's ancient Cadboll Stone, skilfully carved from the landscape so long ago. Tallest Stills in Scotland In pursuit of the exceptional, we distill Glenmorangie's spirit in Scotland's tallest stills. Their long copper necks allow only the very finest vapours to rise to the top. The result is a wonderfully pure and fragrant spirit, bursting with fruity floral complexity. Casks Used Only Twice Our refined spirit matures for at least ten years in carefully selected ex-bourbon oak casks, to create a deliciously smooth and rounded whisky. Although some other distilleries may fill casks many times, we only ever use ours twice. And so, we ensure their fullest depths of flavour enrich our single malt. The 16 Men of Tain For more than 170 years, Glenmorangie has been perfected by our craftsmen, The 16 Men of Tain. Passed down through the generations, their skills owe as much to instinct and feel as they do to meticulous, uncompromising precision. In The Original's rounded character, their dedication brings its own reward. A Whisky of Renown This award-winning single malt delights with a nose of mandarin, lemon and peach softened by vanilla, alongside herbal and floral notes. Silken textures bring forth tastes of creamy vanilla that balance with coconut, almonds and honey, before a gentle, lingering finish. Uniquely smooth and complex, it is the essence of our craft.